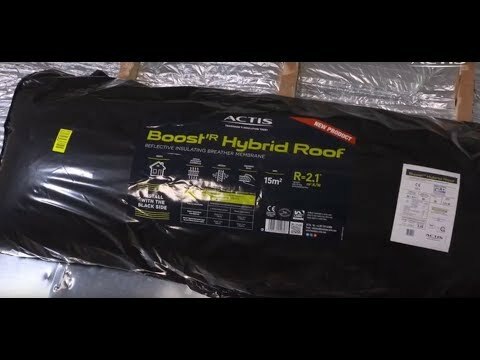 The Actis Boost R Hybrid Reflective Insulated Breathable Membrane is the future of roof insulation. This innovative product has built in thermal performance for maximum insulation properties and long term efficacy. The Actis Boost R Hybrid Reflective Insulated Breathable Membrane provides two functions within a single product – a breathable membrane and insulation – that allows a significant reduction in the number of installation steps. It also reduces the thickness of the main insulation while achieving the same required U Value. 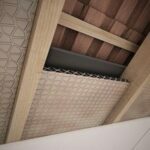 Applied to the cold side of the roof, the Actis Boost R Hybrid Reflective Insulated Breathable Membrane makes the installation process easier because you’ll be able insulate while laying down your underlay. 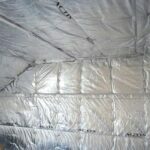 The Actis Boost R Hybrid Reflective Insulated Breathable Membrane can be used in conjunction with any type of insulation such as foil boards and is available in 10 m2 rolls with a thickness of 35 millimetres. The design of the Actis Boost R Hybrid Reflective Insulated Breathable Membrane is very flexible and you’ll be surprised at how lightweight it is. This makes the installation procedure extremely simple and you won’t even require any respiratory or eye protection. Actis has been in the business for over 35 years offering a variety of high performance insulation solutions. An established provider with a loyal client base in the construction industry, Actis products are designed to make the client’s life easier by providing maximum comfort while adhering to the highest manufacturing standards.